Featured are some of our most desirable full eternity rings. 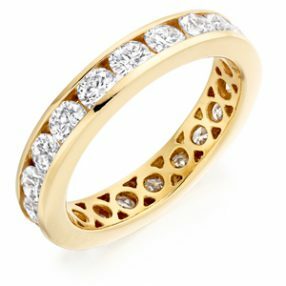 The full eternity ring is made up of diamonds fully set around the band and are traditionally bought as a gift for the birth of your first child – or as an ideal anniversary gift. They can consist of different diamond shapes and coloured gem stones. This is a small selection of our full eternity rings, so please visit us in store so we can guide you in finding the perfect style to compliment your engagement and wedding rings.